Craving greasy, but must eat healthy? Go to Native Foods Cafe!!! Good. I am glad we got that out of the way! 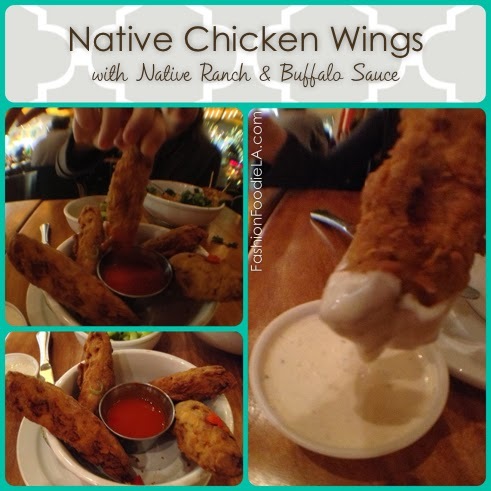 If you have ever wanted something fresh, new and healthy, then you must have tried Native Foods Cafe. They have multiple locations, but they are not your typical vegan joint. I am not a Vegan, but I do love delicious food. Even if that food is made from foods that are not meat, but have the texture of meat. I can handle that. I feel like at most Vegan places, I cannot really understand what they are going to look like or relate to what the dish might taste like. At Native Foods Cafe, the menu is translated to make you understand what the dish is trying to emulate. It makes it easy and not so scary because I can understand the menu. Simple, really. 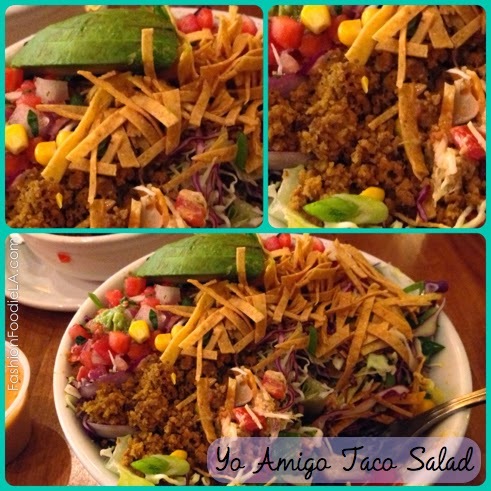 For dinner, we ordered the Sesame Kale Macro Bowl and the Yo Amigo Taco Salad. 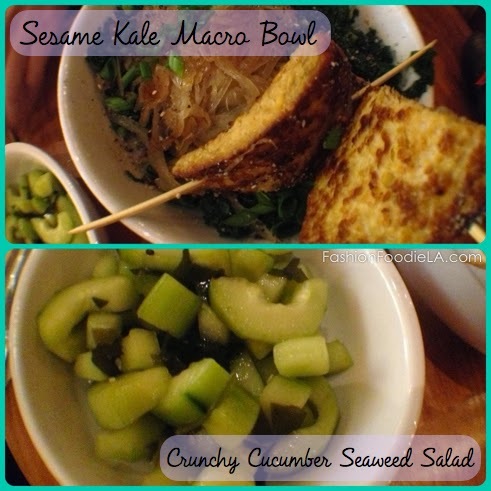 The crunchy cucumber seaweed salad came with the Sesame Kale Macro Bowl and it was refreshing. The art they have at the restaurant is all made of chalk. 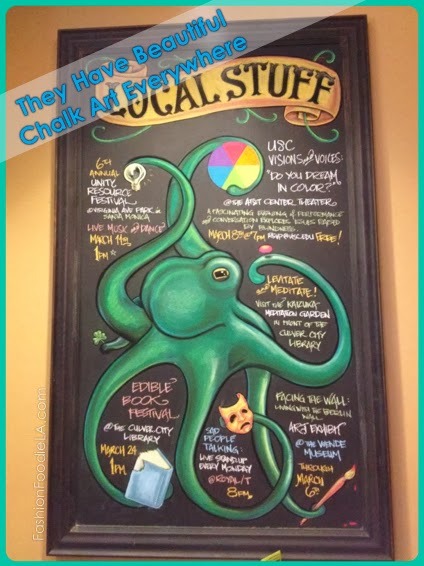 The menu is made of chalk and they even have an events board - like the one with the octopus here. They are not just a restaurant they are also involved with the community and the fact that they advertise events makes them that much better! Now let's get on with the review! Is the restaurant easy to find/park? Yes. It is off Culver Blvd, a very busy street. You can park in any one of the many parking structures around Culver Blvd. Free parking for the first 2 hours! Did it take long to be seated? No. You order at the counter, take your number and grab a seat. It was not busy and we were able to snag a seat near the windows looking over the patio and Culver Blvd. Meals Ordered: Native Chicken Wings, Sesame Kale Macro Bowl and the Yo Amigo Taco Salad. What did you particularly like or dislike about the meal? I love the fact that I can understand the menu - the Vegan food is labeled so I can relate the food to what I am familiar with. Makes ordering less intimidating. Restaurant atmosphere (casual, upscale, stuffy, fun): Casual! Servers bring your food, but you fill and refill your own beverages. Would you come back to this restaurant? Yes! Although I am not Vegan, it is super delicious! Would you recommend this restaurant to others? I highly recommend this to anyone looking for fresh, healthy food to satisfy their craving for greasy, unhealthy food.